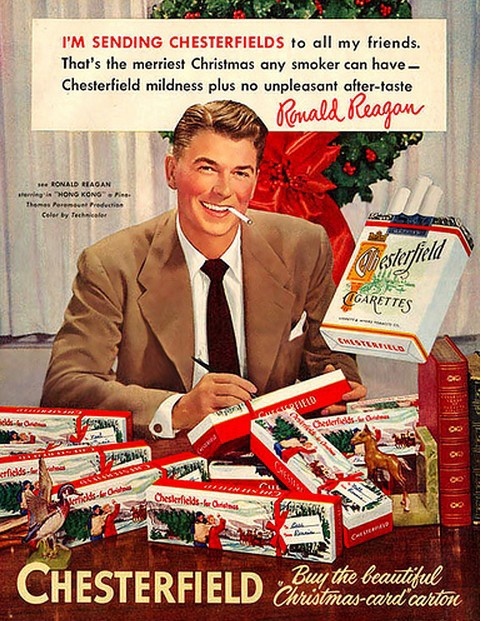 My Favorite Christmas Ad of ALL TIME: Ronald Reagan and Chesterfield Cigarettes. Merry Christmas Everyone! Ever since I was a wee little one, I have been a Reagan fanboy. Nixon and Reagan were the two 8x10 framed photos that I had in my bedroom growing up in the 1980s. As much as it bucks the modern trend, I am a fan of smoking. Not that anyone should be forced to do it, but I just think the world was a better place when cigarettes were accepted and commonplace. One of the many reasons I love Las Vegas. Anyway, getting back to this Advert. This was a Chesterfield Cigarette ad starring famous actor and future President of the United States, Ronald Reagan celebrating Christmas around the year 1948. I have this original ad, framed in the home office, and I look forward it passing it down in the family. Too bad I can't enjoy a Chesterfield. They are only sold in Europe. Camel will have to do. Merry Christmas to you, Weirdpuckett! Thanks for posting that story. I do tend to hang out in casinos more often than I should. Often when I get off work, which means that I am walking through the casino in a suit, so 110% of the visitors (and employees) in the building think I work there. I have directed more tourists to nonexistent bathrooms and guest elevators than I can count. After a long day at work, sometimes it's the little things that keep us going. Enjoy that Pall Mall, sir! And of course, Merry Christmas! Haha! Thanks for posting everyone! You all are welcome to send a carton my way! Through online research I discovered that Chesterfield cigarettes are no longer sold in the US market. They are exclusive to European and Asian markets now. Thanks again for the love and for posting everyone! A doctor friend gave me the full program of the "Patch". After a few weeks, he asked me if it was working. I told him, "They are easy to roll, but hard to keep lit!". I quit 10-15 yrs ago, but still enjoy the smell of fresh tobacco smoke. Hate dirty ashtrays and the smell on a girls breath. Good poste. When ever I hear of Nixon and Reagan makes me think of the Bohemian Grove. We buy them at $17-18 per carton, so I take 1 carton over my limit when I go to the States & people jump at buying them at $35-40 per carton. Hey, I don't miss many tricks! LOL! Thank you for the comments everyone! You know the risks when you decide to smoke. If you get cancer, you can't blame anyone but yourself. If you eat a lot of fast food, you will get fat. If you drink a lot, you might get a DUI or kill someone. That is all on you. Not on Jack Daniels. It can go either way. My Grandfather died at 84 with a cigarette in his hand, puffing away in the hospital bed. He passed away peacefully. Yes, there are others that get lung cancer at die by age 30. You never know. I could have a heart attack before I finish this post. I could get shot in a drive by. I could be standing on a toilet hanging a picture and slip and fall and hit my head on the sink and come up with the idea for the Flux Capacitor. You just never know. I smoke Camel Crush Silver Pack. I like to vary between menthol and non. I buy them by the carton. Here in Vegas you are looking right around $41. Mom & Pop smoke shops are the best values, and they usually give you a free lighter when you buy a carton. When I used to smoke high end cigarettes, it was either Dunhills or Benson & Hedges Deluxe Ultralight Menthol. Then they changed the laws regarding wording and ultralight became known as Silver. Whatever. Flavor is flavor. Thanks again for posting everyone and for the love! Merry Christmas! Actually Mister, I think the taxes on tobacco & alcohol are a selective tax & unconstitutional in your selective countries. I haven't smoked in over a decade but see it as a selective target tax. Money for more bombs & bullets to kill people I have nothing against. Killing seems to be a fad! Thank you for posting and for the love, everyone! Happy New Year! Happy smokin' ! We have Chesterfields here in France, all blond cigarets are 7€, nearly $10!!! Neat old Ad!! Great Xmas one !! YIKES .....I think you need a $ 100.00 bill ( at least ) here to buy a carton !! Great ad from a time when the risk wasn't fully understood. "You know the risks when you decide to smoke. If you get cancer, you can't blame anyone but yourself." Non- smokers have a hole heap of people to blame! It is called second hand smoke. I personally don't yearn for a return of the days when most restaurants and buildings reaked of smoke. I read somewhere that the 2nd hand smoke thing was a scientific lie perpetuated by repetition, like many others. American cigarettes cost around 50 pesos in Mexico. 18.75 pesos = $1.00 USA . I don't smoke have taken cartons back to Canada though. Amer. cigs are $18. a carton in St. Maarten. Mailing cartons from there is a very profitable business. Just ask me. Buy them cheap on the Dutch side & mail them on the French side, where it is the same as mailing in France. regarding the patch: When Patsy on Absolutely Fabulous was smoking while wearing the patch, she told Edwina that she was 'recharging the patch'!